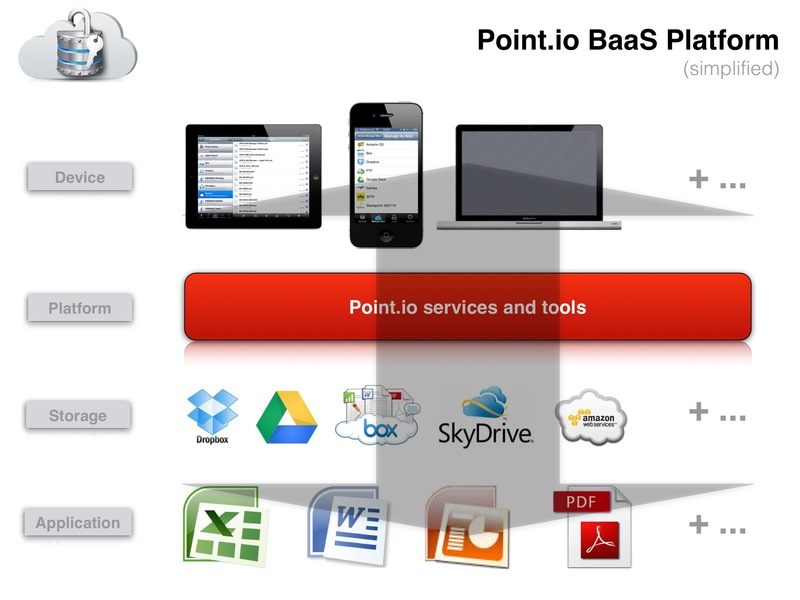 Point.io offers an enterprise Backend-as-a-Service (BaaS) platform (launched on July 16, 2013) and Enterprise Gateway products for specialized enterprise mobile application development. Focused on document management and workflow, the platform is designed to help enterprises embrace BYOD while maintaining control of their content. Bring your own device (BYOD) means the policy of permitting employees to bring personally owned mobile devices (laptops, tablets, and smart phones) to their workplace, and use those devices to access privileged company information and applications. Since the Point.io Gateway handles all secure communication across the firewall, a VPN is no longer required. Users have access to more types of remote storages, including behind-the-firewall repositories like SharePoint, FTP, SFTP, Google Drive and Amazon S3. In addition to its platform launch, Point.io is unveiling two new partnerships. The first is with Stratospherix. The other is with TheHostingPros, which is offering a free Sharepoint site when a Point.io account is setup. FileBrowser by Stratospherix is one of the top-ten most-downloaded apps in the Utilities section of The App Store. The company has over 600,000 users in 60 countries. FileBrowser is now powered by Point.io and includes all the features of the Point.io platform. I first take a look on the native app of Point.io because I think it should contain the main features and gives an overview of how the company’s service is intended for. Starting in July 2013 the version 1.001 of Point.io was offered for iPhone only. The app is ugly designed but can be used to show how the platform works. 1 You can see all your storage connections in one place. For example, Point.io provides a combined view of Box and SharePoint and will be adding additional storage locations such as Dropbox and Documentum in the coming weeks. 2 With Point.io, you get access to your documents on any mobile device, from anywhere, regardless of where the document is stored. 3 Share any file with anyone using secure links. Precisely control what any person can do with your files at all times (e.g. print, edit, save). There is no need to ever send file attachments again. 4 Remove access to any file(s) as soon as they have been used for their intended purpose. Prevent any loss of control over your documents – your files always stay on your network. 5 Ensure control and security over your documents, even when others use their own mobile devices (BYOD). 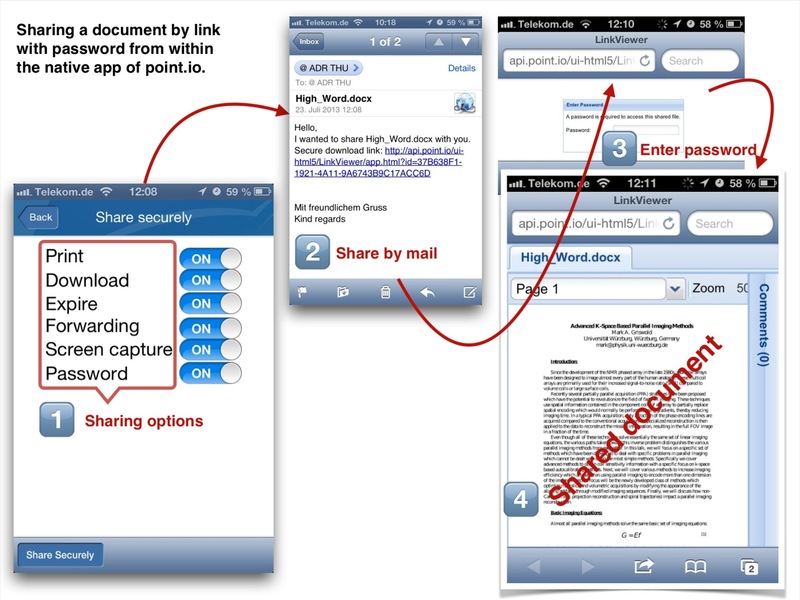 An interesting application is sending a document not as an attachment but as a secured link. This feature is new and provided neither by actual file management apps nor by any well-known cloud client apps for Box, iDriveSync, Dropbox, Google Drive, etc. 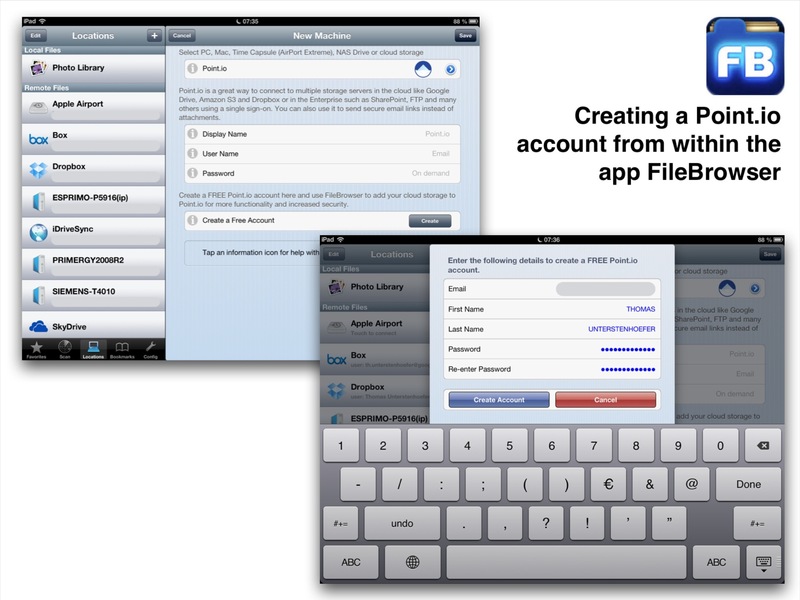 With FileBrowser, the iPad or iPhone becomes a powerful tool for business and private use, allowing users to access content on company file servers, workstations or cloud storage from anywhere. The FileBrowser app is easy to use and allows files to be downloaded, edited and uploaded back to the original location or distributed to other employees, partners or customers. With FileBrowser, users can access their documents from their mobile device and no longer need to take bulky laptops to meetings or out of the office when visiting clients. Let’s take a look on the universal app FileBrowser by Stratospherix, UK. FileBrowser is the only file management app with Point.io integration at the time. The best way to summarize all the features is to visualize them in a mind map. FileBrowser allows to create an account on Point.io. FileBrowser’s integration with the Point.io platform provides real benefits for users. With Point.io, access is simpler than ever before – users need only enter a single username and password to gain access to all their file servers and cloud storage locations. At the time this announcement is far away from reality. One more time an app was released although it doesn’t meet the basic requirements of users yet. This is definitely the best way to lose favor with customers or to lose customers. A basic rule of app development was ignored: Release when finished. What are the benefits when using Point.io? As you can see there is just one Point.io account necessary to access different cloud storages and Windows network drives. Instead of listing your connections in the left navigation window they are now listed on the right side. Not supported accounts have to be configured as usual and will still appear in the left navigation section of FileBrowser. Point.io says that a VPN connection is no longer needed. I cannot see any benefit in that because VPN is a well-functioning and developed technique which is secure and totally controlled by yourself. If connecting via Point.io there is an additional security risk with services and tools of Point.io. At the time other disadvantages are the incompleteness of services and some mysterious behaviors of FileBrowser on the iPad (no feedback when loading large files) and FileBrowser in general when accessing files on Google Drive (No display, Point.io operation failed, Error retrieving file info, Folder not found). 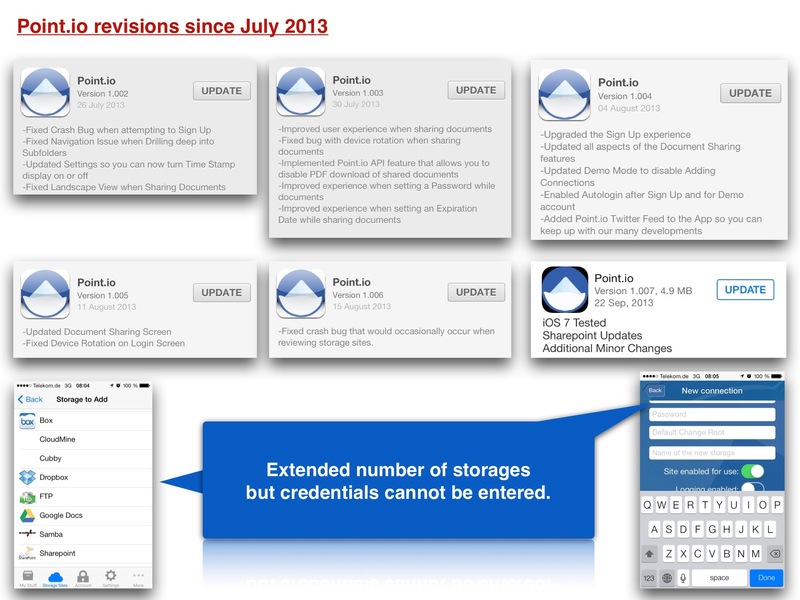 Supported cloud storages on multiple devices require just one configuration for Point.io. Access to Point.io then enables access to all storages configured on Point.io. These sharing options control the level of access granted by this link. What should be mentioned is that FileBrowser is still a powerful app with a perfect UI. Stratospherix would be well-advised not to move Point.io integration into the foreground as they did when releasing version 2.9.1 on July 18, 2013.